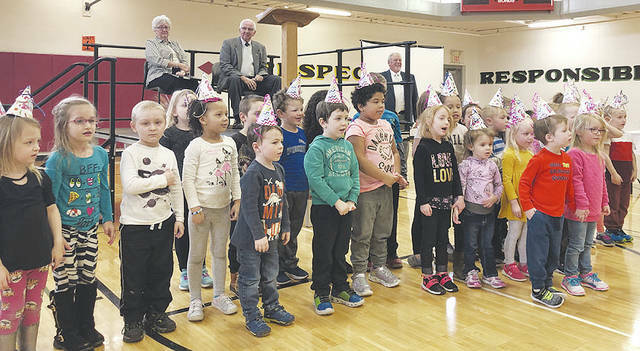 Than Johnson and Mary Lee Gecowets (at left on platform) recite the Pledge of Allegiance along with Champaign Family YMCA preschoolers and nearly 200 attendees of the 20th anniversary celebration on Wednesday in the YMCA gymnasium. 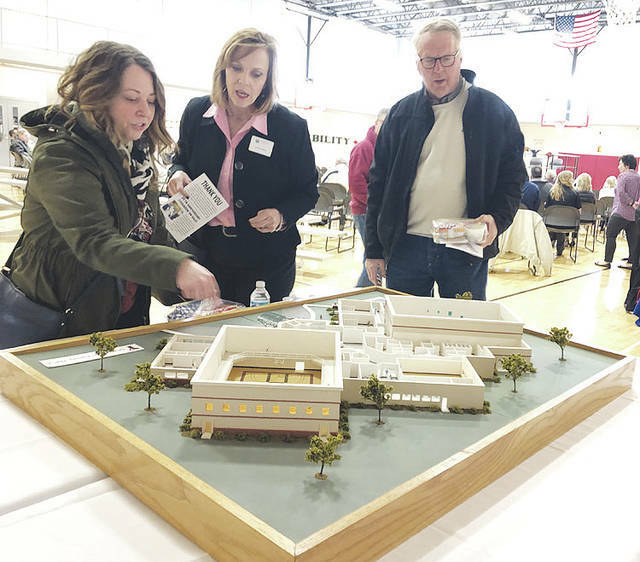 Samantha Kapp-Williamson (left) and Julie Markin of Urbana University view an architectural model of the Champaign Family YMCA while David Smith (right) joins in the conversation during Wednesday’s event marking the Y’s 20th anniversary. The celebration was held in the Y’s gymnasium and included approximately 200 people. Students in the Champaign Family YMCA preschool program perform during the Y’s 20th anniversary celebration on Wednesday. Community leaders and members of the public gathered in the Champaign Family YMCA gymnasium for a 20th anniversary celebration luncheon on Wednesday. The event marked 20 years since the Y first opened for use. Nearly 200 people attended the celebration, including Y charter members, past and present YMCA board members, community/business leaders and organizational community stakeholders that included service clubs and educational entities. The Y currently has 4,638 members and a budget of $2,710,000 for 2019, according to information provided by the Y. In contrast, the year the Y opened in 1999, the budget was $300,000. Situated on land donated by the Melvin Miller family – the same family which donated land for Urbana’s city park – the YMCA later received a donation of camp land from the Shiffer family in the northeast part of the county. A sequence of countless donations large and small over 20-plus years has helped build the facility into a premier community gathering spot featuring an indoor swimming pool and spa tub, locker rooms with saunas, a gymnasium with suspended walking track, multiple exercise rooms with weights and fitness training machines and entire building sections dedicated to pre-school and after-school childcare. The Y is located on Urbana’s east side at 191 Community Drive. It has a childcare satellite location in Mechanicsburg. In his speech “The Y Beginning,” the Y’s first president, Than Johnson, recounted the delicate, political and arduous process of lining up the many sources of funding to make the Y dream a reality that would benefit all sectors of the community. Detailing the process of “The Y Build” in her speech, 20-year Y board member Mary Lee Gecowets said the expansive dream of a YMCA in Urbana actually dates 30 years in the past. Board member and Y Treasurer Dennis Serie presented an account of “The Y Today.” Current growth opportunities and current needs of the Y include a family locker room (estimated to cost $150,000), playground equipment ($70,000), an 8-passenger van ($30,000), Camp Shiffer enhancements ($10,000) and pre-school strollers ($5,000). Those seeking more information about assisting the Y with these needs are asked to contact Champaign Family Y Chief Executive Officer Paul Waldsmith or Serie. The Y’s current board president, Tim Kemper, led and coordinated the anniversary event’s agenda, with a welcome greeting to those attending. Waldsmith addressed the crowd and Y Childcare Director Sonya Stonerock and her staff coordinated a brief but patriotically spirited performance of Y preschoolers in song. During the ceremony, recognitions were presented to two individuals who contributed pivotal time and knowledge to help launch and maintain a successful Y presence in an Urbana community that was previously without such a facility. Betsy Bohl was honored posthumously for her energetic efforts to build what is considered by many to be a jewel in the crown of the community. Bohl’s family was in attendance to accept the dedication of a photo-engraved plaque in her memory, which will be placed beside a similar plaque in memory of Connie Toomire, who was Melvin Miller’s daughter. Former Champaign Family YMCA CEO Kathy Finney, who served as leader of the Urbana Y from 1998-2012, was in attendance and recognized for her efforts in guiding the Y’s crucial early years. The Y features a 5-star rated daycare program for infants, toddlers and pre-schoolers in Urbana and oversees a 4-star rated pre-school program in Mechanicsburg. There is also before- and after-school care at four local schools, and summer day camps each year serve 150 school-age kids. There is also a United Way-funded kindergarten Readiness Camp. Through the Y’s annual campaign and Invest in Youth scholarship fund, the organization ensures no one is denied the benefits of a Y membership. Each year, more than $90,000 in qualified financial assistance is provided to low-income Champaign County residents as part of the Y’s social responsibility mission. The Y participates in a Community Health Improvement Plan, focusing on early childhood, healthy living, mental health and substance abuse prevention to improve the quality of life locally. Swim lessons serve more than 300 youths per year and the Y youth sports programs serve more than 1,000 each year. The Y also manages the operations of the city’s outdoor pool at Melvin Miller Park. Y employees number 189 total, 25 of whom are full-time and 124 of whom are part-time. Seasonal pool employees total 20 and season camp employees total 20. The Urbana Daily Citizen will feature a package about the Y’s 20th anniversary in the annual Progress Edition, which will be published in late April.